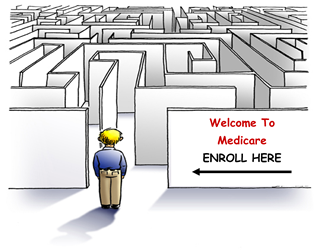 Managing the Labyrinth of Medicare | Penniall & Associates, Inc. When have you last evaluated your healthcare coverage and do you have a strategy in place to maintain the right plan with the right provider at the right price? Whether Medicare currently provides your coverage or you have just started to prepare yourself for enrollment, pause and evaluate you and your family’s needs. A review of your current plan and Medicare options available will put you in a better position to arrange for the best coverage possible. BEFORE you apply for Medicare, consider you and your family’s healthcare options. Keep the enrollment periods below in mind as you compare and evaluate what is best for everyone. If you decide Medicare offers the coverage you want or have already enrolled, review the plans annually to maintain the best coverage possible. Initial Enrollment Period (IEP): Technically, you have the 3 months before your 65th birthday, your birthday month and the 3 months after your birthday for guaranteed enrollment, but submit applications before your birthday to avoid costly penalties that may apply to late submissions. Although California and Oregon’s birthday rule allows you to change supplemental insurance around your birthday month without going through an underwriting process, we again encourage you to apply early. The complexities of healthcare coverage including Medicare warrant extensive research and/or involvement of a specialist to help discern what’s right for you. There are different deadlines and enrollment periods for the different available coverage's that must be understood when you start evaluating Medicare. In some cases, you won’t have the opportunity to select better Medicare coverage after making initial decisions without going through an insurance company’s underwriting process. It is very important you carefully consider when to apply for Medicare and what plans to select during your Initial Enrollment period, otherwise an insurance company may deny your request for the coverage that ultimately works best for you. While many with special needs are also eligible for this program, this article will focus on benefits available to those 65 and older, nearing or in retirement. Medicare is a 53-year-old program first signed into law by President Johnson for people ages 65 and over, regardless of income, medical history or health status. It has had a significant impact on the quality and longevity of lives in the United States and has evolved dramatically since first introduced in 1965. In fact, the entire healthcare landscape now looks very different from before - especially post-ACA (the Affordable Care Act). We have never had greater access to healthcare as a whole but an unequal premium cost structure has also emerged, making it more important than ever to tailor your coverage according to your own individual needs. The cost of health insurance premiums in some cases has surpassed monthly mortgage payments in certain states and Medicare has adopted an income adjustment strategy that adds an additional amount to premiums for higher income beneficiaries based on adjusted gross income plus tax-exempt interest earned from 2 years ago. The more you understand about health insurance and Medicare options available and the associated costs, the better you can arrange your coverage for optimal care at affordable prices. Ask questions, get answers, and learn how to structure your and your family’s healthcare for the future. Just because you can apply for Medicare when you reach age 65 doesn’t mean you have to or even that you should. If still employed, find out specifics about your group health insurance and options for your family if you leave and apply for Medicare. Since employers pay 50-80% or more of an employee’s premium and typically a generous portion of their family’s insurance, group health insurance usually provides the best coverage at the most affordable price. Additionally, private group insurance premiums are paid with pretax dollars and Medicare is paid with after tax dollars. A net difference will likely involve more savings than what only a premium comparison would imply. Compare Medicare premiums to what you actually pay for group health insurance, keeping in mind that doctors often prefer working with patients covered by group policies and have started to deny patients with Medicare or individual coverage. Group plans have higher reimbursements than Medicare and individual coverage pays even less. Cancelling your group insurance to enroll in Medicare could cause serious problems, especially if you have dependent children or your spouse does not qualify for Medicare. Medicare offer many popular benefits with rules not as commonly understood. It covers 80% of medical expenses leaving you with the burden of paying for the remaining 20%. Once you make the decision to enroll in Medicare, you must decide how you want to receive your Part A (Hospital) and Part B (Medical / Doctor) benefits and whether you need additional coverage. You can get your Medicare benefits through Original Medicare or a Medicare Advantage Plan (like an HMO or PPO). The Federal Government manages Original Medicare providing eligible individuals coverage for hospitals, doctors and other health care expenses. Private insurance companies offer Medicare Advantage Plans (Part C) and have also designed supplement plans to complement Original Medicare benefits. Medicare Advantage plans often provide prescription drug coverage and Medicare Part D is also available for this coverage. Medicare Advantage and supplement plans as well as Medicare Part D (drug plan) provide different benefits at different costs with different rules that help lower your out-of-pocket medical expenses not covered by Part A and Part B. Stiff penalties apply every month you are eligible but not enrolled in a drug plan and you will only have guaranteed issue of optional supplement plans providing additional coverage ONCE during the Initial Enrollment Period, which occurs at age 65 or after the loss of your employer healthcare coverage. After you have established Medicare, you will have to go through an insurance company’s underwriting process if you decide to apply for a better supplement plan later. The US Department of Health and Human Services has compounded the importance of making the best initial decision possible since it will eliminate one of the most comprehensive and popular supplement plans (PLAN F) on January 1, 2020. If you don’t already have this plan in place by then, you have lost the opportunity to apply for it. Once you have implemented Medicare, do not “set it and forget it”. You should review your Medicare Advantage and any supplement plan and/or drug coverage in place annually. You will have the option to switch between Medicare Advantage plans and from Medicare Advantage to Original Medicare (and vice versa) each year during the Medicare Open Enrollment period (October 15-December 7). You will also have the option to compare your drug plan with what other insurance companies offer during this period allowing you to identify lower-cost options if available that could save you thousands of dollars depending on your prescription drug list. Your drug plan’s covered drugs (formulary) will change over time, which may increase premiums, co-pays and deductibles substantially. In addition, always call your drug plan immediately if your doctor prescribes a new drug. Contact your drug plan before leaving your doctor’s office to find out if they cover it and what it costs. If it’s not on your plan’s formulary, ask for an alternative prescription. By law, each drug plan must offer at least 2 drugs in every class to treat specific symptoms. The Medicare Open Enrollment period DOES NOT apply to Medicare Supplement plans. California and Oregon, however, have implemented a Medicare Supplement law called the “Birthday Rule” that allows those who live in these states to change their Medicare supplement from one insurance company to another with no medical underwriting during their birthday month. All supplement plans must cover basic benefits as defined by Medicare but each insurance company prices them differently and offers varying levels of service. Premium prices will vary and change over time. Companies charging lower premiums at age 65 usually increase them in subsequent year and they eventually grow expensive when compared to those that charged a higher premium initially. By periodically comparing supplement plans around your birthday, especially at milestone ages (70 and 80), you have the option of making changes if it would save money or enhance service without compromising your coverage. Medicare was designed and has been altered over the years with the intention of benefitting those eligible for enrollment. Multiple coverage options exist not to confuse us but to satisfy unique circumstances and needs. Take time to learn what’s available and take advantage of the options available to establish and maintain the very best coverage possible.